Hello guys, here we have come up again with the “oh my God” kind of news, well yes, you guessed it right. It is about the new and tremendous iPhone series that has been launched the day before. Well first things first, Apple never disappoints. This is not even a biased opinion but a proven fact that every year there is a massive upgrade, different designs of iPhones and colors that tarnish the little expectations and raise the bar to some other level of perfection. If we boost about them it will not be an exaggeration because iPhones always have an impact in the market and the last year has just acknowledged the fact that Apple iPhone X purely set the new amazing standards and hence found the number: 1 smartphone around the globe. Keeping that in mind, and because of the excessive interest of people in it, this year Apple has given an extra oomph to the iPhone X. Here we have now introduced to Apple iPhone Xs, Xs Max and the new iPhone XR. Well talking about the names, we can really guess that the upgraded iPhones are larger and bigger in sizes for a more easy and comfortable user experience. iPhone Xs has that super Retina display with the size of 5.8”, having A12 Bionic Chip, dual camera system and a fantastic feel to the body. Whereas the new iPhone Xs Max has come in 6.5” Display size which is the biggest iPhone that has ever been made. These iPhones have the most durable glass that has never been experienced before. Besides iPhone XR has come up with Liquid Retina display, A12 Bionic Chip, advanced Face ID, and stunning in every way. As far as the prices are concerned, the XR is totally affordable and budget friendly than the iPhone Xs and iPhone Xs Max. But we need more reviews to decide which iPhone to switch to, this year. 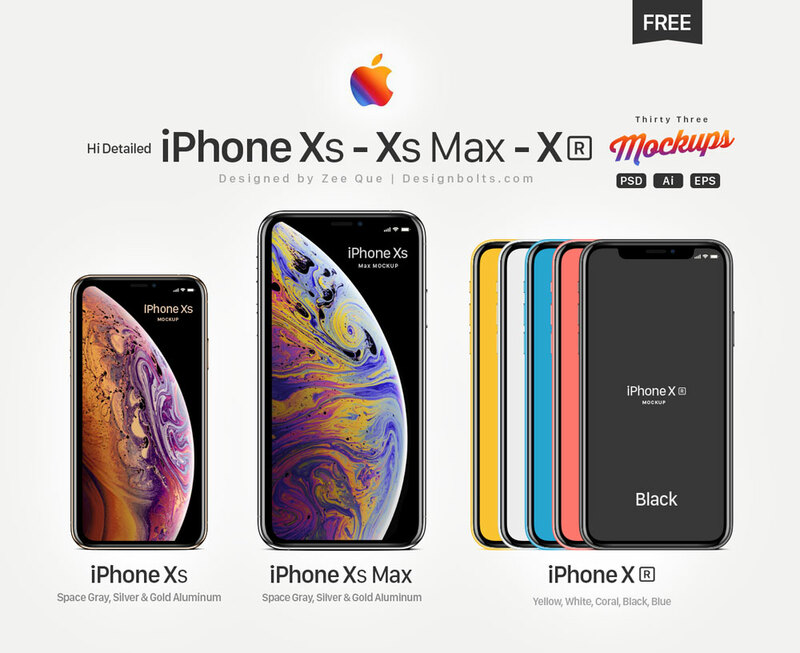 Till then you must look at these free Vector Apple iPhone Xs, Xs Max & Xr Mockups. You can display an application, a picture/image or anything of this sort through this mockup before your client as a presentation. He will surely get a clear idea that how a thing would appear on iPhone’s screen. For more design, tech and art collection, stay tuned to the blog. Great share thank you for the mockups.